The scrapbooking industry may not be as popular as it was five or six years ago but it is still going strong because it is a great way to preserve family history. A personalized scrapbook also makes a wonderful gift for family and friends. Scrapbooking is not just about pasting photographs into an album but about illustrating "stories" by making artistic collages of photos, paper patterns, and lettering. Stickers, rub-ons, stamped designs, die-cut shapes and embellishments (tags, grommets, brads, buttons, cardboard and metal frames, ribbons, lace, wire, beads, sequins, jewels, glitter) are used to enhance the collages and create wonderfully decorated pages. This industry is very icon and theme driven. Artists that want to design for it must think about the reasons why photographs are taken and why a person is willing to take the time to make a scrapbook with them. And then, the artist should create art that compliments those photos. Popular reasons to take photos are family orientated activities such as sports, hobbies, celebration (birthday, anniversary, graduation), travel, and holidays but there are lots more. 5. scrapbooking consumer shows such as Scrapbook Expo. What an artist should know and do to license art to the scrapbooking industry. 1. 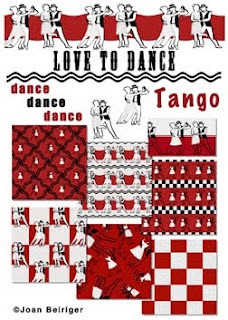 The traditional scrapbook page is 12 by 12-inches and patterns should be designed at least that size. Other popular sizes are 8-1/2 by 11, 6 by 6, 7 by 7, and 8 by 8-inches. 2. Many scrapbookers (scrapers) purchase scrapbooking designs from internet vendors and print their own paper and page layouts. Artists interested in this avenue of licensing opportunities should remember this when searching for manufacturers that license art. But because consumers are now printing their own papers there is less opportunity to license pattern art to manufacturers that print paper unless it is part of a multi-product collection. 3. Many manufacturers are producing multi-product themed collections. These collections may include a selection of paper patterns and borders, stickers, rub-ons, die-cut shapes, and various embellishments. Thus, an artist that presents a complete collection package to a manufacturer has a better chance in getting a licensing deal. 4. Every manufacturer has different needs and each may include different products in their collections. Note: I haven't licensed my art to this industry but in looking at various collections in craft stores some collections include 4-6 background patterns and several borders, a sheet or two of stickers with 8-12 related theme icons on each page, a sheet of press-on words and phrases, a bunch of die-cut shapes and numerous embellishments. 5. Do a survey of manufacturers to determine what kinds of themed art to create that differs (in themes and/or art style) from what is already in the marketplace. Listed below are a few manufacturers that license art for papers and other scrapbooking accessories. Not listed are manufacturers that mainly produce products for other industries such as stickers or rubber stamps even though the products are also used for scrapbooking. If you are interested in those manufacturers, visit a website such as the Scrapbooking Warehouse. Read the comments to learn more information about the scrapbooking industry. Comments about this article and names of additional scrapbooking manufacturers not listed is greatly appreciated. Click on the comment section below to write your comments. Artists and photographers that are experts in using Photoshop recommend that if images are going to be printed commercially (and they will be when art is licensed) they should be edited and worked in the CMYK color mode and not RGB. The reason is that printed colors varies from what is seen on the monitor. It is true that CMYK and RGB modes differ. But do you know how and why they differ? When should you use RGB or use CMYK? And you may not necessarily need to work in CMYK mode or even should. Keep reading to find out more. What is RGB & CMYK? Artists need to understand the two major color models for describing colors - RGB and CMYK. Colors are device-dependent and just as each person sees color differently so does each monitor, digital camera, and scanner. Printers are also device-dependent and each outputs color differently. RGB (red, green, blue) describes color as seen with the eye, computer monitor, digital camera, and scanner. CMYK (cyan "blue shade," magenta "red shade," yellow, black) is used to describe colors as related to inks (impurities, how they absorb in paper, and press setup) for commercial color printing. Color descriptions (profiles) for specific devices (RGB and CMYK) helps achieve accurate color. The range of color (gamut), also called color space, for RGB devices is MUCH larger than what can be printed by CMYK color devices. The blue color space is especially reduced in the CMYK gamut. 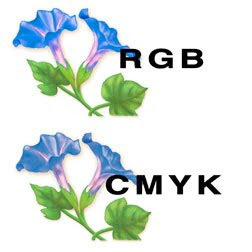 The example shown at the beginning of this article shows a highly saturated blue flower in the RGB mode and what the color looks like when converted to CMYK. When Photoshop converts a file from RGB to CMYK it does the best it can in replacing the colors of the larger color spacewith ones in the smaller space. But many times the color hues change and look undersaturated and dull as it does in the example. Therefore, images should be created while in the CMYK mode or pseudo CMYK mode* to get the best possible color when art is printed. And the correct CMYK profile must be used while doing so. In theory, the colors CMY can produce black but because inks often are impure, black ink must be added to get a true black. Note: The letter K in CMYK stands for keyed. In the printing industry, the cyan-magenta-and-yellow printing plates are matched (keyed) to the black plate. * pseudo CMYK mode means using the RGB mode with the out-of-CMYK gamut warning on. What is the correct RGB & CMYK profile to use? Unfortunately, there is no correct color profile because there is no standard for either RGB or CMYK. But profiles are important in managing color between images edited in Photoshop and destination devices. So every Photoshop file MUST have an embedded RGB or CMYK profile that was used to create that file otherwise there is no telling what the colors will look like when printed. Hints: To embed a color profile in your file, check the Embedding Color Profile box when you Save or Save As the file. If the wrong profile is listed, select the right one by opening the Assign Profile window (Edit / Assign Profile). And to assign the profiles you want for your working space once you decide which ones, open Edit / Color Settings and select one for RGB and one for CMYK. Many professional photographers use Adobe RGB (1998) ICC color profile for their working space because its color range can be easily modified for various printers. However, many artists (including me) prefer to calibrate their monitor and use that profile for their Photoshop RGB working space. Note: How to calibrate monitors is beyond this post but I plan to write an article in the near future. Ideally you should use a particular printer's CMYK profile when editing and creating art in Photoshop. But usually it is unknown and you will need to use a generic profile. U.S. Web Coated SWOP v2 is the default CMYK profile that ships with recent versions of Photoshop. But some of the resources that I used to write this post (see below) suggests that you do not use it as a generic profile. Instead they recommend choosing either the GRACol profile that is used for sheetfed presses (brochures and custom print jobs), or SWOP Grade Paper 3, or SWOP Grade Paper 5 used for web presses (used for magazine and other high-volume printing) in the United States. For printers in Europe, they recommend that one of the FOGRA profiles be used. Note: I have been using the U.S. Web Coated SWOP v2 but because of these recommendations I decided to switch to SWOP Grade Paper 3 as a generic CMYK profile. The reason why I chose that one is because I "think" that it has the smallest gamut (high volume printer and thinner paper) and assume that colors in Photoshop will be accurate for most printers. The above discussion is intended to give you information about profiles and what experts recommend. If you already have RGB and CMYK profiles that are successful for you, please DO NOT not change them. Why edit and design in RGB instead of CMYK? There are distinct disadvantages in editing and designing in the CMYK mode. CMYK files are larger than RGB. They take significantly longer to open and save if the files have lots of layers like mine do. Also not all of Photoshop filters are available in CMYK and some non-Adobe plug-ins only work in RGB. Of course, you could switch back-and-forth between CMYK and RGB if you want to use the filters or plug-ins but converting between the modes also takes time. However, the main drawback in going back-and-forth between the modes is that the color quality continually degrades as Photoshop increases and decrease the color gamut. It took me a long frustrating time to figure out why the colors in my images were degrading. I now work and save my master art files only in RGB and work in pseudo CMYK mode. When I need an actual CMYK file, I convert to the CMYK mode and save it in a different file name. What is Pseudo CMYK mode? The colors in the ENTIRE layer can be edited to make sure they are in gamut by either adjusting the hue and/or the lightness and saturation in the Hue/Saturation (command + U) adjustments command. Better yet, if only a small amount of color in the layer is out of gamut, edit only it by opening the Replace Color adjustment window (Image / Adjustments / Replace Color . . .) and do the following steps. 1. In the window click on Localized Color Clusters. 2. Use the eye dropper to select the out of gamut region on the image layer. 3. Adjust the Fuzziness slider bar until the approximate out of gamut region shows in the Replace Color window. 4. Adjust the Saturation or Lightness or a combination of both with their slider bars until the out of gamut color on the image layer disappears. ** If you prefer a different gamut warning color instead of gray, you can change it by going to the Photoshop / Preferences / Transparency & Gamut window. Click on the Gamut Warning Color box and choose the color you wish. I like to use 100% black. My recommendations when working with RGB and CMYK colors in Photoshop. 1. Choose RGB and CMYK profiles and assign them to your working spaces. 2. Embed either an RGB or CMYK profile in all your saved image files. 3. Edit and create images in Photoshop that uses only CMYK colors. To do this, either use the CMYK mode or the pseudo CMYK mode. 4. Use a RGB profile for images that will be seen on monitors such as emails, e-newsletters, websites and blogs. 5. Send the manufacturer the type of files (CMYK or RGB) they request for printing. Make sure that the color profile is embedded in the file. If CMYK or RGB is not specified, send RGB. When the printer converts the file to CMYK, you have a better chance that it prints the correct color because the profile is specific to your monitor and not a generic CMYK profile. Read the following articles to learn more in depth information about what was covered by this post. "UPDIG Guildelines" (Universal Photographic Digital Imaging Guidelines) - scan down the page to see the article. If you would like to share information on what color profiles you use or any comment about this article, please click on the comment section below. Many articles have been written on how to gain brand recognition and each article tells different ways to achieve it. Suggestions include that you need to have unique art, a logo, a domain name, a website, social media (blog, twitter,facebook), belong to organizations, network, participate in charities, etc. You also need to market your work which could be by advertising, doing press releases, write (articles, newsletters, e-books), exhibit at licensing shows, make videos, get your art onto products, etc. In the past, it was believed that you need to market only your art but now branding experts believe that the best way to optimize brand recognition is to not only market your art but also yourself. 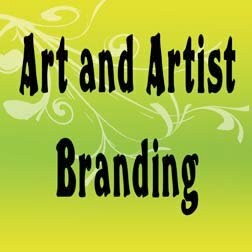 The following gives links to articles on branding and marketing art (first section) and yourself (second section). Read and use all the information in the articles to form your own branding strategy that you find feasible to implement. 3. that it very visibility in order to achieve brand recognition. And having visibility means that you need to market your art in not just one way but numerous ways. Read the article by art agent Eric Kuskey of Creative Brands Group in "Eight Steps to Become an Art Brand" to learn basic information on becoming an art brand. And, to find different opinions on marketing to achieve brand recognition of your art read the following five articles. "Branding Art: from Surf Boards to Greeting Cards" - Kate Harper's interview with licensing director Marie Brophy of artist Drew Brophy's art. Consumers are more willing to purchase products with art by the artist that they recognize than those they do not. By branding yourself besides your art, clients (manufacturers, retailers and ultimately the consumers) form a relationship with you. And those connections can enhance the purchase of product with your art. That surely works for artists Thomas Kincaid and Mary Englebreit. 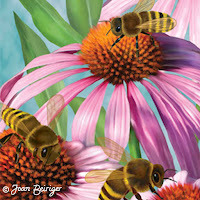 Both of those artists have been licensing their art for many years and they still have loyal followers. Below are links to several articles that discusses personnel branding. "The Definition of Online Personal Branding and How it Can Help You" by Mark Montova. This article is not just for artists but the information discussed can be easily translated for use by you. "Brand Yourself As an Artist on Twitter" by Lori Mcnee. According to the article, using twitter is one of the quickest ways to build brand recognition. This article was updated 7/17/18. I welcome any comments. Please click on "comments" in order to write your comment.